How much time do you spend exercising per week? Less than 10 minutes. I never work out. Can you touch your toes with your legs straight? I can if I put in enough effort. How often do you feel tired or fatigued? Only when I demand too much from my body. Which of these options best describes your diet? I eat everything, but in a balanced way. I prefer meat and sweets. I'm not thinking too much about my diet. During the last year, how many times did you catch a cold? So many I can't even remember. Cold? Nope, never heard of it. I don't remember the last time I had a good laugh. Congrats, you're 20 years old! No matter how many years you have lived, your body is still young and healthy! You're still in your thirties. Your body is just fine, a perfect age to start big projects and feel beautiful and strong. 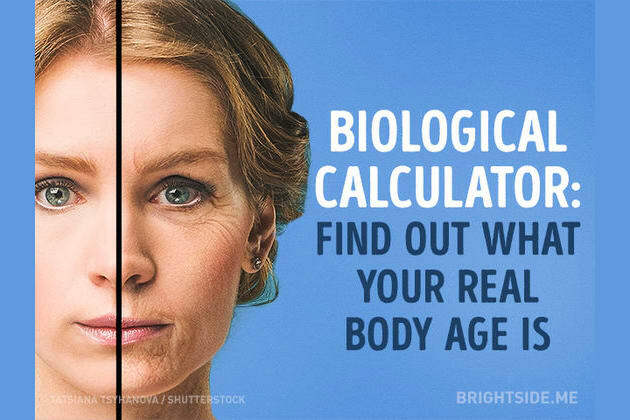 Your body is about 40 years old. If you're in fact older, you may be proud of yourself, your body is just as healthy as it was a couple of years ago. Your body is 50+ years old by now. If you're in fact younger, pay much more attention to your diet or exercises. Lack of good care may cause your body some serious problems in the future. What time is it now according to your biological clock? This calculator has the answer!